20 Years ago on October 12, 1990 I got up the courage to tell my girlfriend of 3 months... "I Love You" But I wasn't about to be any ordinary schmuck! My friend Tim Harris and I drove around town taking pictures of me in front of street signs to "tell a story" This was not the easiest of tasks because of course this was WAY before Google Maps much less the internet and GPS. Anyway, we went down town and took a picture in front of an "I Street" sign. I was wearing various items that represented who I was. I had a racket in one hand, shorts, a snowboard boot on one foot and a bible in my other hand. The next picture was in front of the street "Love Ln" In this photo I was wearing a black suit and tie and was looking at a white rose. "U" street was next and then of course "Rebecca Way"
Becky was at the Master's College that semester so I sent her a care package that included a little stuffed animal I called Melchizidek. There was a tape I made with the song "I L-O-V-E YOU by Take 6" as the main track. My intent was for her to simply thumb leisurely through the pictures while subliminally listening to the music in the background as were my instructions along with the care package. She is way too impatient and jumped to the last picture! I didn't actually write the words in the letter much less speak them until I saw her that weekend of Oct 12. I invited her to assist me while I was teaching a seminar at the CLASS (Church Leadership and Sunday School) convention held at Capital Christian Center. I was the College Intern at Arcade at the time and my seminar was on how to lead a college Bible Study. Anyway, that night Becky and I had dinner with her parents in Citrus Heights and I finally got the courage up to tell her... "I Love You" and it's only been truer ever since! I wonder if "Blue" is a fair description of how I've felt over the last couple of weeks. I wrestle internally with my system of beliefs and have found the struggle between my internal locus of control and my unconditional faith in a Sovereign God rages on. This is perhaps life's greatest dichotomies. I believe with my whole heart that God reigns supreme and rules with a tender and compassionate father's heart. I believe also with all of my cognitive being that I have been empowered to accomplish great things in this world, in this life we have been given to live. I believe that we indeed need to LIVE and not simply exist. It amuses me still how just a few dollars in my pocket (or not) changes my disposition and my physical demeanor. Powerless and yet so powerful! Who am I? OK so I never met the man. In fact the closest I ever came to him was at Arco Arena many years ago when he led a crusade in Sacramento. I never even saw him in person as I was outside in the parking lot watching the whole thing on a JumboTron. I HAVE met Bob Mitchell though! Bob, former President of Young Life, came and spoke with our region at Woodleaf here in CA just the other day. He recounted the story that affected me profoundly. Bob began his journey with Christ under Jim Rayburn at Young Life club 37. This is funny because even though it was called 37 it was actually the first Young Life club way back in the early 40's. Bob was 13 when Jim led him to Christ and of course Jim Rayburn's legacy is that of countless others led to Christ. He is certainly worth another whole discussion but for now I want to focus on Bob and Billy. You see when Billy asked Jim for help working with the kids that were coming to Christ through his ministry, Jim sent Bob. Bob is to this day one of the most prolific leaders Young Life has ever seen and will undoubtedly be greeted by stadium cheers when he gets to Glory. When Bob was asked to become President of Young Life, he didn't want to jump into the position without seeking counsel so he called Dr. Graham. 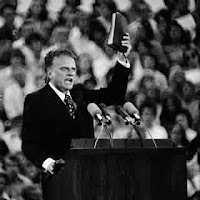 Of course it wasn't the easiest thing to do, to get a hold of Billy Graham, but because of their relationship in the past, Dr. Graham agreed to host a meeting in Toronto, Canada. They met in Billy's hotel room and after some discussion Billy dropped to his knees. This is where it gets good. As Bob was retelling this story you could see the profound nature in which Bob was affected. Dr. Billy Graham on his knees at the feet of Jesus pouring out his heart for the kids that would be reached by the ministry of Young Life. What was clear to me was that Billy's emphasis during his prayer was not about Young Life but it was about the Love of Jesus. Bob said... "When this man prayed, you got the feeling that God was LISTENING!" WOW! Billy continued his prayer with supplication over his own son Franklin who was struggling with his own salvation back then. Fast forward you know that Franklin is now carrying on Billy Graham's legacy at BGEA. What I love is that Billy Graham, Jim Rayburn, and Bob Mitchell, 3 Giants of the faith... their core emphasis is focus on Jesus. You as an individual... focus on Jesus and everything big or small will line up. On behalf of Shelly's family I would like to thank you for coming to help celebrate Shelly' life. It's not a mistake to use the word "Celebration" even though this is clearly a sad time. I want to give you permission to smile again and to laugh and to rejoice. Today you're going to hear some stories that will certainly stir your emotions and I say let them be stirred. If you knew Shelly at all, you knew that she was a passionate woman. She was a lover AND a fighter! Right Anthony? Today our purpose is to honor Shelly with our laughter as well as our tears. In 2 Sam 12 David wrestles with the death of his son. For 7 days he wouldn't eat or sleep .. he probably didn't even change his clothes! He PLEADED with God not to take his son... but on the 7th day, he died. David's servants were all freaking out wondering what the king was going to do when he heard that his son was finally dead. David got up, washed up and worshipped God, then he ate. He explained to his servants that he didn't know what was going to happen while his son was alive but now he does know... the son was NOT going to return to him, he was going to go to his son. Now this is just a narrative about an imperfect man. This is not a prescription for our behavior necessarily but maybe a good model. It seems that David had a GREAT understanding of God. So today we are going to celebrate, we are going to worship, and we are going to eat! Let me invite David Shaffer up and lead us in worship! Today is a day to remember Shelly and the awesome woman that she was and our purpose for being here today is to honor her. I believe the best way to honor her would be us to reflect on our own lives and the significance we each personally strive for. In honor of her I would like for all of us for the next few moments to reflect on our own lives and on our own hearts. Some observations about the Human Heart -We describe a person without compassion as "heartless" and we urge him to "have a heart"
Saints have "hearts of gold" If we need to speak at the most intimate level, we ask for a "heart to heart" talk. "lighthearted" is how we feel on vacation at the beach. But when we lose our passion for life, when a deadness sets in which we cannot seem to shake, we confess, "my heart's just not in it" Sometimes the heart in your chest speeds up. Like when you exercise, your heart rate goes to 120 beats per minute, you start burning fat, your body releases endorphins, your blood vessels expand and your body is full of life. This also happens when you fall in love... like on the 4th of July about 20 years ago... when Anthony met Shelly and he KNEW within minutes... this one is different! When your heart is pumpin, you can feel EVERYTHING and it's GREAT! Now sometimes your heart slows down... in life there are lots of things that are downers... it starts when you're a kid... when other kids say mean things like "you're fat!" or "why do you have so many freckles?"... It get's worse... when you go through that first break up or you lose a job or your investments fail or you can't pay the electricity bill yada yada, I'm sure you can fill in the blanks here. Sometimes it gets so bad that you want to numb your heart... to slow your heart down to the point where you don't feel anything. Shelly's physical heart grew weak and quit beating a couple weeks ago but her spiritual heart... it was huge! It was the size of a giraffe heart! It kept beating strongly all throughout her sickness! She discovered she had cancer shortly after Shelby was born almost 4 years ago and through the ups and downs of treatment and sickness and health she opened her children's eyes to see the faithfulness of God. My question for you today is "what is the state of your heart"? Physically you could probably stand to exercise more and maybe eat more vegetables but you are completely missing the point if you think that's all I'm talking about here. Shelly knew with her whole heart that she was about to meet God face to face and she did it with grace and confidence! She knew Jesus personally and intimately and she knew Him as her savior. The true source of vitality in ones heart is Jesus. Jesus 2000 years ago invaded history and took the wickedness of the world upon himself. He took the sin of the world upon himself. He paid the penalty of sin with His life and He conquered death so that death for us is no longer death but a transition into eternal life with God. Do you know what I'm talking about? Do you have the same confidence that Shelly did? Like it or not your body is going to experience the same fate. The question is what is going to happen to your soul? Do you know in your heart of hearts what the status is of your spirit is? Do you want to know this Jesus that I've been talking about? He wants to know you! He wants to have a relationship that is personal and intimate with you and he wants to begin right now. Are you ready? OH GOD MY HEART HURTS! I met a young woman about 14 years ago... and she's leaving. Her name is Shelly and she is the reason my heart hurts so badly right now! When we met she was so full of life and so ready to tackle all of life's challenges. Her husband was a drunk but she loved him anyway. Her friends all told her she should leave him but I was opposed cuz I saw in her that she still loved him and wanted to make it work. One day, all of a sudden, he wasn't drunk anymore and although life wasn't instantly all roses... the journey started along the right path... again. You see God had a track record of faithfullness even when times were tough. When I met Anthony I could see why Shelly loved him, he was a good man. If you know me you know that I don't believe any man is good, by nature, but this man Anthony was good because he realized that God loved him and had a plan for his life... and along they went. Little Taylor was born! How did that happen? (of course we all know) but really... How !!!? The medical staff gave up all except that wonderful nurse who kicked everyone out of the hospital room where Shelly was with her incompetent cervix and all. That nurse said "if you believe in God you better start prayin!" Pray we did... and again all of a sudden, Taylor is 11 years old and just a beautiful reflection of your mother. Sydney, Anthony, Jaden, and Shelby... children 2 through 5. So much for struggling to get pregnant! Now what? Breast Cancer? F(bleep) YOU! Shelly beat you once... no twice! Yeah yeah, life happens... ups and downs, houses and jobs, dogs and electricity bills and yada yada. It's all good though right? A beautiful family and friends who truly care... Shelly why are you leaving? Just a couple weeks ago we were all hanging out having hawaiian bbq remember? WTF! I believe in God, I believe His Word. I believe death is just a transition into life eternal... But it still hurts. It hurts it hurts it hurts.